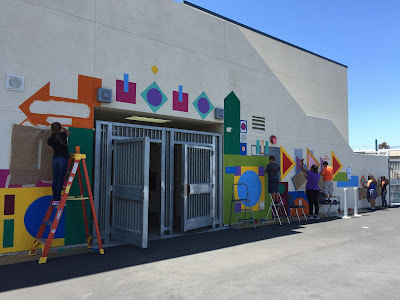 shine brite zamorano: our new mural! Once again, our 5th grade students participated in a legacy project at the end of the school year. This provides an opportunity for them to leave a positive mark on the school and our community. They look forward to this experience every year. 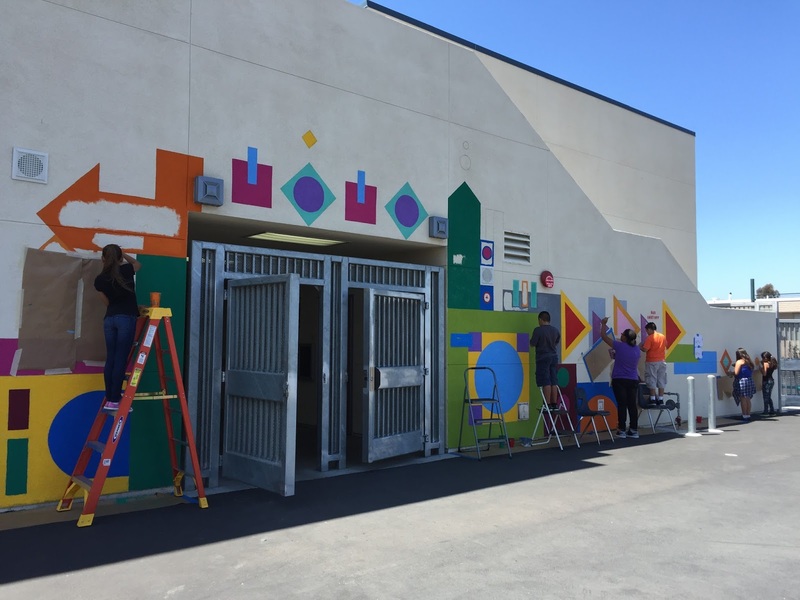 This year's mural was done on our new 2 story building that houses kindergarten and 2nd grade classrooms. It's a very cool looking piece of architecture, but the exterior is so plain compared to all the other colorfully painted buildings on our campus. 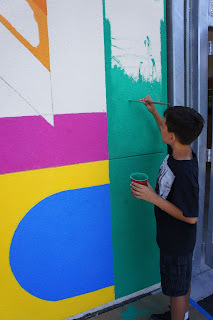 The idea for the mural was to provide our kindergarten students with a fun and colorful introduction to geometric shapes, shape and color patterns, and overlapping shapes. The gate that is in the center of the wall is the main entry and exit for our kinders. The mural is also highly visible from one of our lunch arbors and brightens the view from various points on campus, as well as the neighboring community park. Thanks to everyone involved- our students, their teachers for being flexible with their schedules, and our administration for seeing the power of these murals and continuing to support public art projects like these on our campus. Hi there! 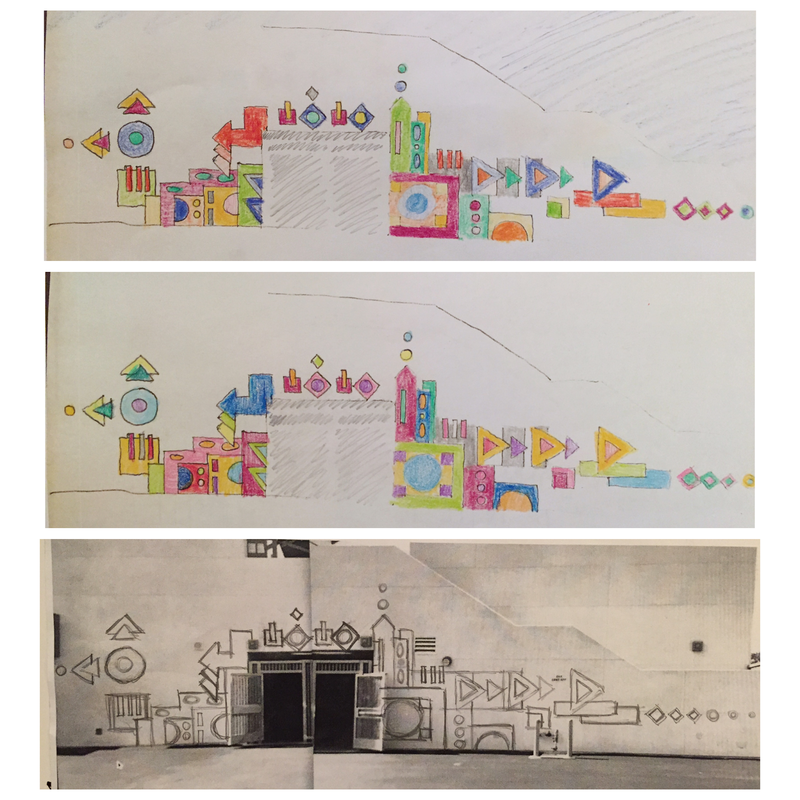 I'm curious how you present/structure the process of designing a mural to your students? I've been teaching art for seven years and am starting at a new school that desperately needs some murals, but I don't have much experience with murals with kids. i have designed most of the murals on our site. i explain the process- brainstorming, rough drafts, scaling up, and such to each small group as they participate on the wall. This is awesome! I like seeing the whole planning process. I'm seeing a little Mary Blair influence. Or it could just be all those 60th Disney Anniversary commercials in my subconscious. thanks, mary! definitely some mary blair in there:) love her work. Looks great! I wondered what type of paint did you use...and on what type of surface? I LOVE this!!! It looks great. 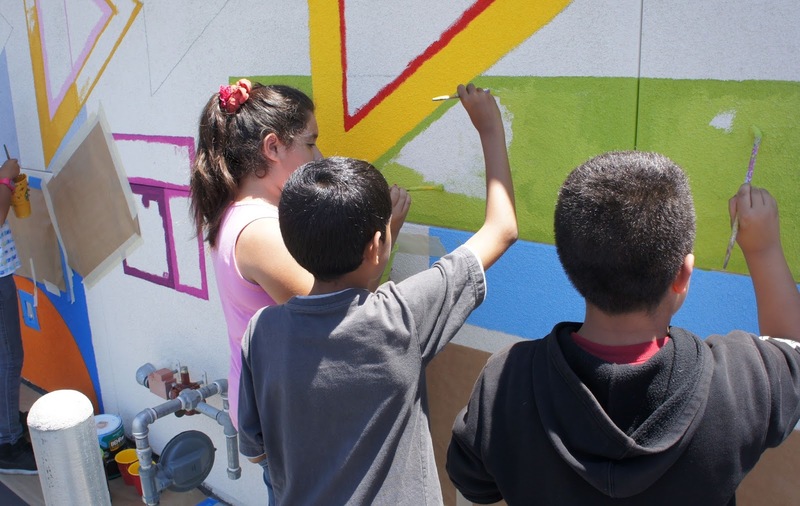 Please share what type of paint you use and suggestions for making murals go smoother. I have never attempted one and would love to with the kids. Great job! It looks very nice and interesting because of students' effort. Best wishes for this year's mural. Did the kids help with the design or did you come up with design? Hey Marcia:) Thanks for following up over here. We have done a legacy mural with our 5ths for the past 7 years. 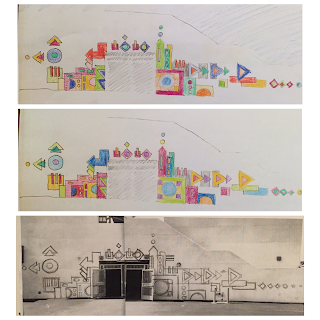 Most years I have done the designing. A couple were inspired by student plans. If you have any more questions let me know.